Use this discount code at Diamond Heaven to save 10% off their new wedding collection. Shop at Diamond Heaven for up to 50% off jewellery and accessories. Enjoy free delivery from Diamond Heaven today! 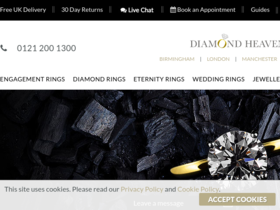 Check out Diamond Heaven online for their latest special offers.